It was lunchtime during a conference at the Valikhanov Institute of History in Almaty, an event convened to examine the Central Asian Revolt of 1916 – or, as the program had it, “The Kazakh National-Liberation movement of 1916.” During the morning session, I had been criticized by Rysbek Sarsenbai, editor of Kazakhstan’s Zhas Alash newspaper, for suggesting that looking through a national-liberation movement lens might not be the best way of understanding the violence of a century ago in Central Asia. The summer of 1916 saw the outbreak of a widespread rebellion against the Russian colonial regime, sparked by a decree calling for the conscription of Central Asian men into labor battalions for service on the Eastern Front during World War I. Beginning in Khujand and Jizzakh in modern-day Tajikistan and Uzbekistan respectively, the rebellion spread rapidly to other parts of Central Asia, including Semirechie, a fertile region now divided between southeastern Kazakhstan and Northern Kyrgyzstan. The main targets of the rebels were Russian settlers. The revolt ended up being brutally suppressed by Russian forces shortly before the collapse of the tsarist regime in 1917. Some local historians and political activists have even gone a step further. Taking a cue from a paper by Sarsenbai, one of the conclusions of the Almaty conference was that the suppression of the revolt could be characterized as ‘genocide’ against the Kazakh people by the Russian imperial state. These accusations of genocide were first heard from the ‘Asaba’ opposition party in Kyrgyzstan almost 20 years ago, and the interpretation gained currency among some historians and opposition groups in both Kyrgyzstan and Kazakhstan in the run-up to this centenary year. The ‘genocide’ accusation has not been officially endorsed or accepted in either country, and it has been strongly rejected by Russian historians. The response in Tajikistan, Uzbekistan and Turkmenistan has been more muted. The dispute over the origins and legacy of the 1916 revolt has turned unexpectedly bitter between Russian historians on the one hand and their Kazakhstani and Kyrgyz counterparts on the other. It has also spilled over into the public sphere: rival YouTube videos attract strongly nationalist commentary from either side. RT, the Kremlin-financed international broadcaster, has commissioned a documentary film on the revolt in Semirechie (including an English version), and there are rival Kyrgyz and Russian websites hosting archival documents that each proclaim to provide the ‘real truth’ about the revolt. Since 2015, there have been several academic conferences on 1916 in Kyrgyzstan, Kazakhstan and Russia. In the case of the Russian conference, some of my fellow scholars told me privately that the event was held not because of any sudden upsurge of interest in the subject, but na zakaz – in response to a government desire to counter the interpretations coming out of Central Asia. 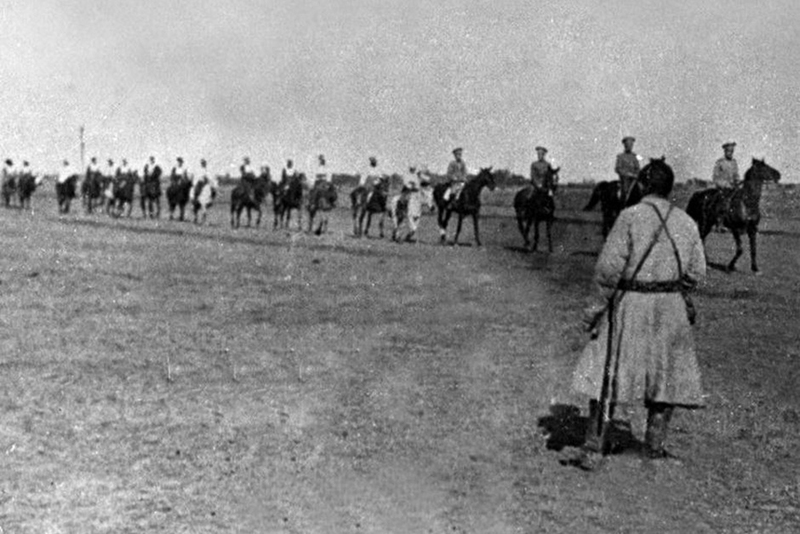 Some Russian historians have branded the revolt as an act of disloyalty by the ‘natives’ of Central Asia, who engaged in unprovoked attacks on unarmed settlers. Some Russian historians also allege that the revolt was fomented by Ottoman or German agents, a popular theory among Tsarist officials at the time because it exonerated them from any responsibility for inciting the rebellion. No concrete evidence has ever been uncovered to support an Ottoman or German connection to the 1916 events. A more measured interpretation, which has been promoted by Tatiana Kotiukova of the Russian Academy of Sciences, is that the revolt was a ‘general tragedy’ for the Russian settlers and the peoples of Central Asia alike, prompted by the Tsarist regime’s catastrophic miscalculation of introducing conscription in a region that had never been fully integrated into the empire. This was the conclusion of a conference organized at Moscow State University in September 2015, to which many Central Asian scholars were invited and which produced some excellent scholarship. Yet, even this apparent compromise avoids confronting the realities of Russian colonialism in Central Asia. The revolt was triggered by conscription and the pressures of war, but it had much deeper roots in tsarist colonization policies during the two decades leading up to 1916. That period saw thousands of hectares of the best land in Semirechie, as well as on the northern steppe, seized from the Kazakhs and Kyrgyz who farmed and pastured their animals on it, and handed over to Slavic peasant settlers from European Russia. The ‘general tragedy’ argument also glosses over the massive disparity in casualties on either side. While the initial slaughter of about 3,500 settlers in Semirechie was horrific, and cannot be minimized, the fact remains that at least 10 times as many Kazakhs and Kyrgyz were killed during Russian punitive expeditions. In addition, at least 150,000 souls, principally Kyrgyz, died while attempting to flee to Chinese territory. The Urkun, or exodus, is a trauma that runs deep in Kyrgyz culture to this day. In the aftermath of the revolt, Turkestan’s governor general, Aleksey Kuropatkin, issued a notorious decree that land was to be seized for settlement “wherever Russian blood was shed.” He proposed creating an ethnically-cleansed zone for Russian settlement on the best land in the region around Issyk-Kul, with Kyrgyz forcibly relocated to mountainous areas near Naryn. In effect, Kuropatkin wanted to impose what would have been a system of apartheid. So the Russian colonial regime certainly engaged in brutal collective punishment and ethnic cleansing when suppressing the 1916 revolt, just as the French did in Algeria, and the British did on the North-West Frontier and in Iraq during the first half of the 20th century. Ultimately, Russia shares a dark colonial past with its Western rivals – something that many Russian historians refuse to accept. Still, was what happened in 1916 genocide, as some Kazakh and Kyrgyz historians and opposition politicians now allege? In my view the answer is no. “Genocide” is an extremely emotive term, but it has a very precise legal definition. There is no clear evidence that the Russian colonial regime had the “intent to destroy, in whole or in part” the Kyrgyz and Kazakhs as “a national, ethnical, racial or religious group, as such.” Indeed, in January 1917, Kuropatkin was making plans to resettle returning Kyrgyz and Kazakh refugees, albeit largely because the empire still needed them as laborers. The accusations of genocide, although currently only promoted by a small minority, are potentially very destructive, particularly for Kazakhstan and Kyrgyzstan, which still have substantial Russian minorities and where Russian is widely spoken. The bitter legacies of colonialism cannot and should not be ignored or denied, as they all too frequently are in Russia, but the politics of cultural purity are a dead end. Central Asia is no different from Western Europe or North America in that respect. Back to those Narynkol potatoes in the beshbarmak: the reason they are there is because Russian settlers introduced them in the 19th century, and yet they are now a canonical part of Kazakhstan’s national dish. The table was also adorned with Russian and Korean salads, even as the conversation was almost exclusively in Kazakh (except at my corner) – quite an unusual experience in predominantly Russophone Almaty. Cultural and linguistic mixing of this kind is an accepted and often celebrated fact of life for most Kazakhstanis. Central Asia’s legacies from an often painful past are complex, and cannot be properly understood through a modern nationalist prism. The best way to preserve the legacy and remember the lessons of the 1916 Central Asian Revolt is to avoid instrumentalizing the suffering of its victims for contemporary political purposes, and instead focus on questions of historical responsibility and agency.